When Kris and I talked about Nintendo Direct from last week, we touched upon Mario Kart 8 Deluxe briefly. And it got me thinking. Mario Kart 8 Deluxe has some cool new features that 8 on the Wii U didn’t have. I believe there may be a few new characters as well as some new items. There’s also an improved Battle Mode. Not to mention, the Deluxe version will include all the DLC that came out on Mario Kart 8. This doesn’t sound enticing to the people who have already bought all the DLC, but Kris and I, even though we said we would, never bought any of the DLC. So we’re getting something out of it. We pre-ordered the game and I’m excited to get my hands on it, even though we’ve basically already played it. While I’m happy with a deluxe version of the latest Mario Kart game, I think I still would have liked a new version of Mario Kart. Mario Kart 9 or, perhaps, Mario Kart Switch? Everyone remember Mario Kart: Double Dash for the Nintendo Gamecube from way back in late 2003? That was a great game! Kris and I would most always be on a team, her being Daisy and me being Yoshi. She would drive while I tossed the items and hit people with my tongue. We had a lot of fun and had some great memories from that game. The point of the Nintendo Switch is to “switch” things up, take it with you, and play with friends. I think a remake of a Mario Kart game where the main premise was to be on a team and “switch” drivers and item-throwers in the middle of a race would be a great idea for the new console. 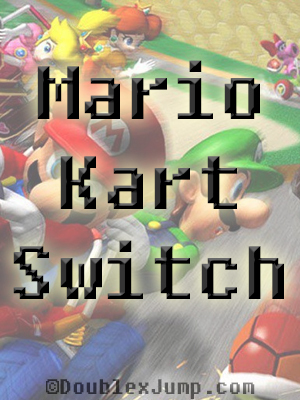 With the technology in the Joy-Cons, I’m sure there are plenty of ways they could have improved the game with new tracks, karts, and characters. Why remake a game that’s three-years-old when you can remake a game that’s based on teamwork that’s 14-years-old? Like I said, I’m happy to be getting a new version of Mario Kart 8… but I still would love to see an updated version of an old classic Mario Kart game, Mario Kart: Double Dash. Sign me on, Nintendo! I have too many great ideas to pass up. What do you think of this idea? What are your thoughts on Mario Kart 8 Deluxe? Are you getting the game? Let me know in the comments below! I think Nintendo spent such a great deal of time with Mario Kart 8 for a system that sold terribly. Because of that, they feel it would be wasted if they came out with an entirely new game considering many who buy a Switch never owned the WiiU version. Not sure how I feel about that, but I never had a WiiU and so I’ve pre-ordered it day one. Double Dash was always my favorite! I thought it had the best feel and the GameCube controller was perfect for it. I loved the dual-rider and double-item mechanics. Funny how it was one of the most not-so-well-received games in the franchise! I’m definitely excited for the deluxe version! And I do understand why they’re coming out with it. Though I do miss Double Dash, lol. Double Dash is so underrated! I love playing co-op, and mixing and matching drivers. I’m in the same boat about Mario Kart 8 Deluxe. Excited to play it, but I wish there were more to it than a better version of the Wii U game. I’m excited for a real Battle Mode and the new characters, but I wish there were new tracks. The tracks are what I look forward to the most and that’s one thing that won’t really be there. But, like I said, we never bought the DLC, so some things will be new to us. I;m glad we didn’t buy it though because then we would have felt like we spent our money for nothing.